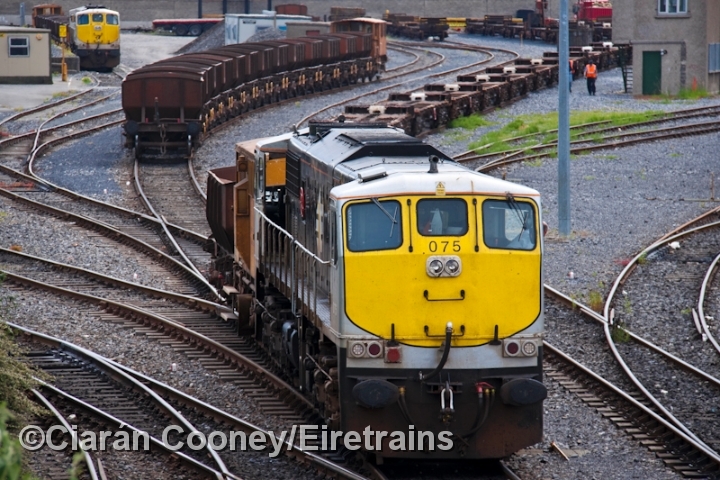 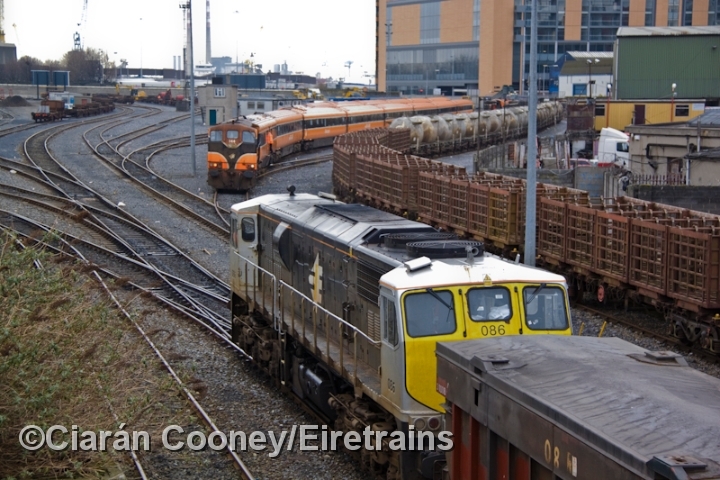 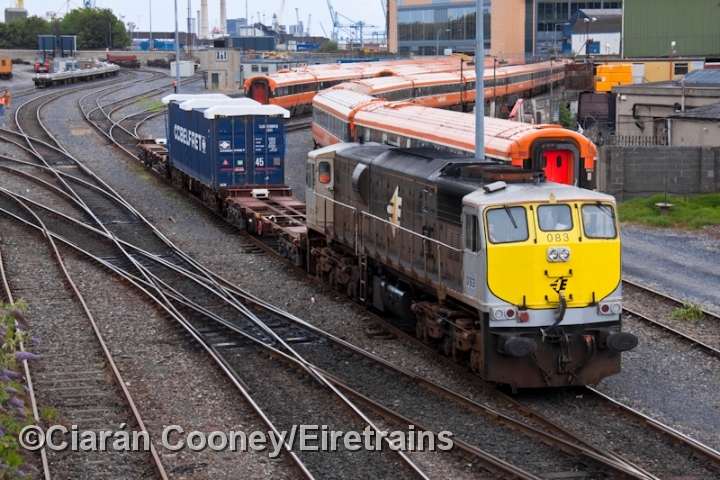 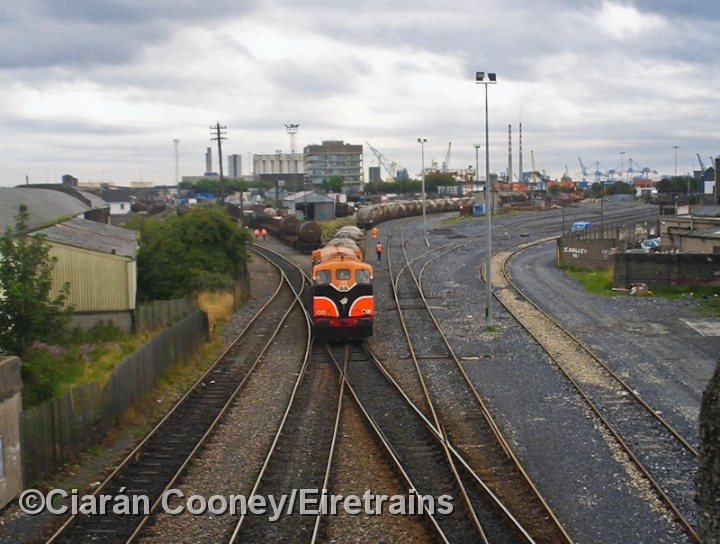 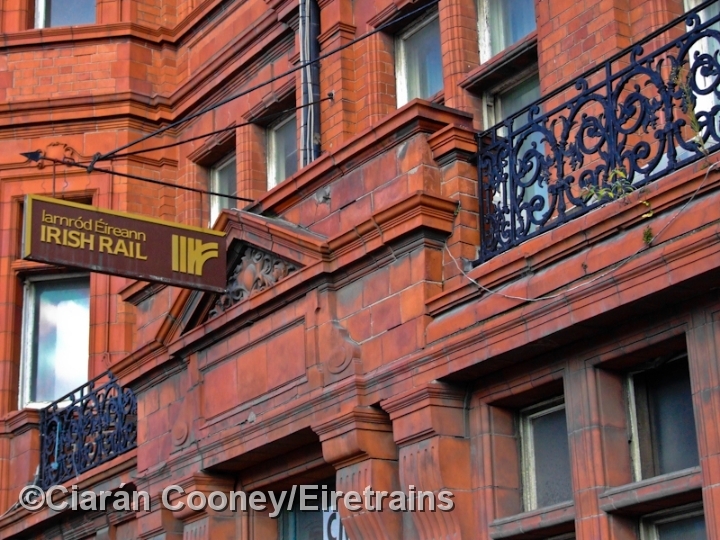 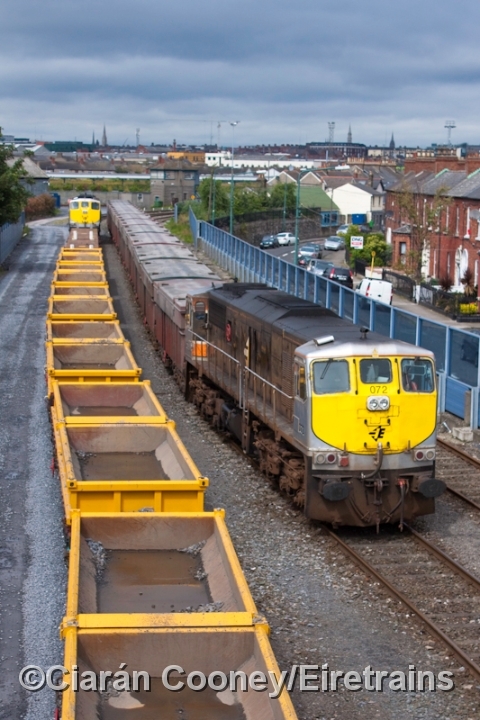 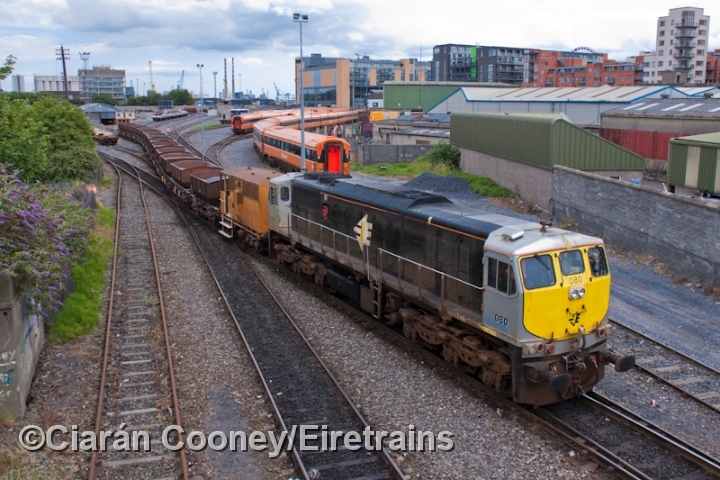 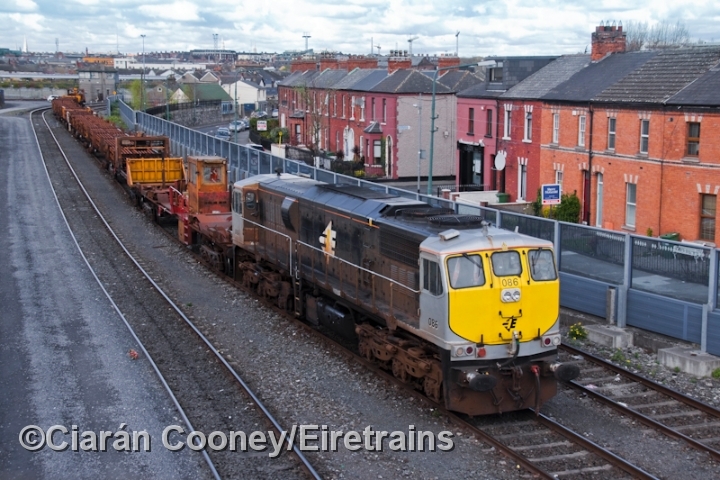 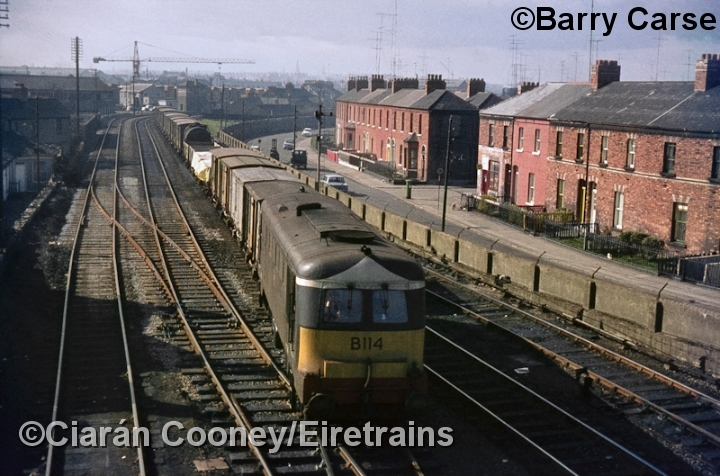 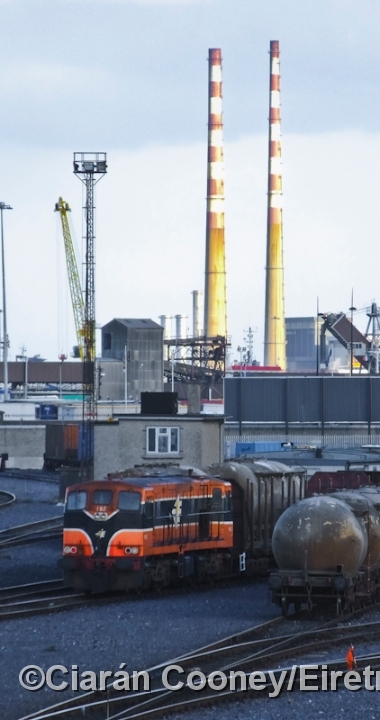 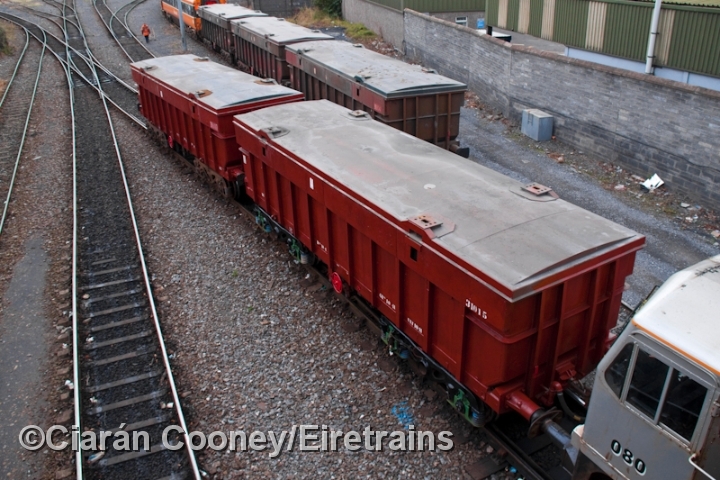 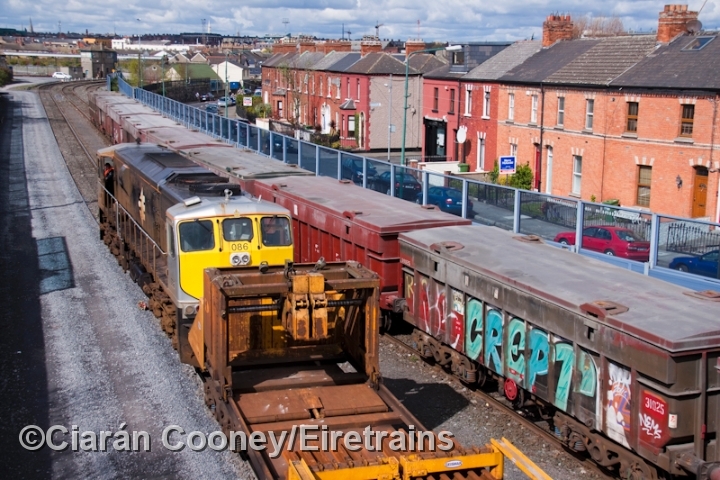 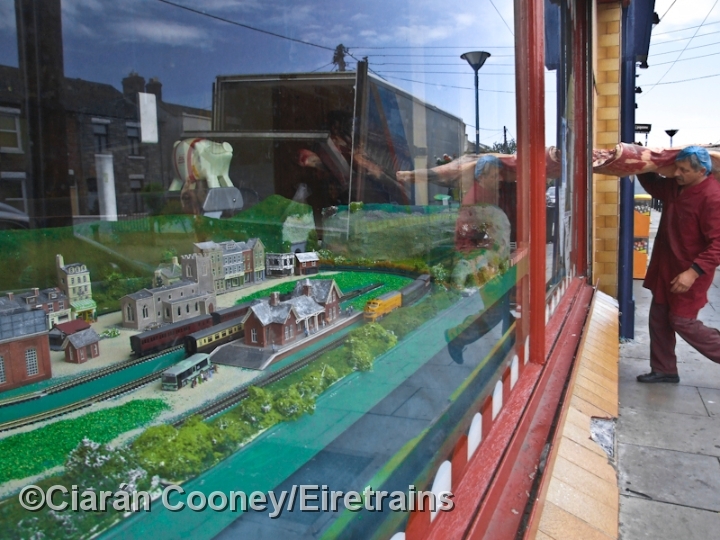 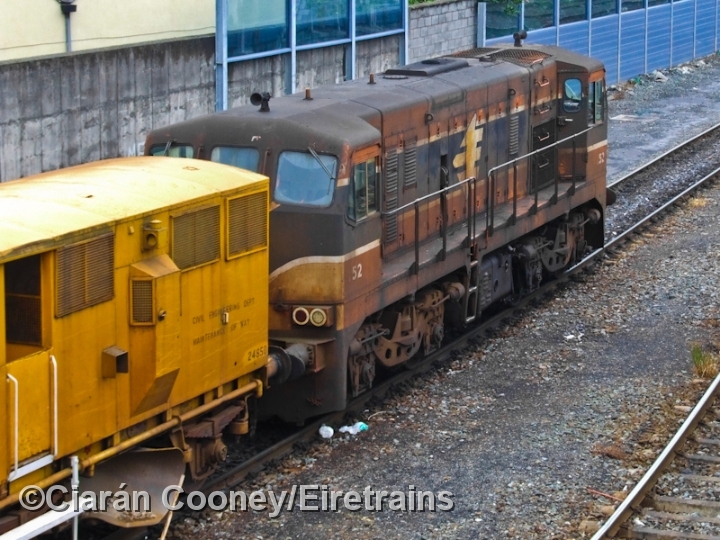 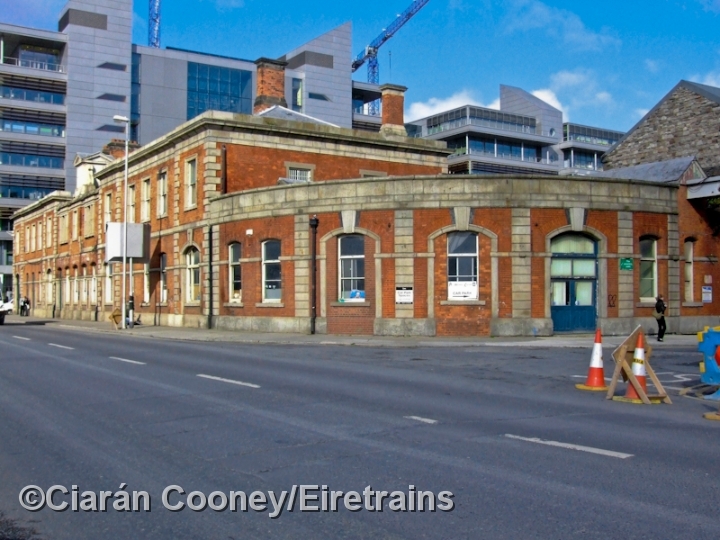 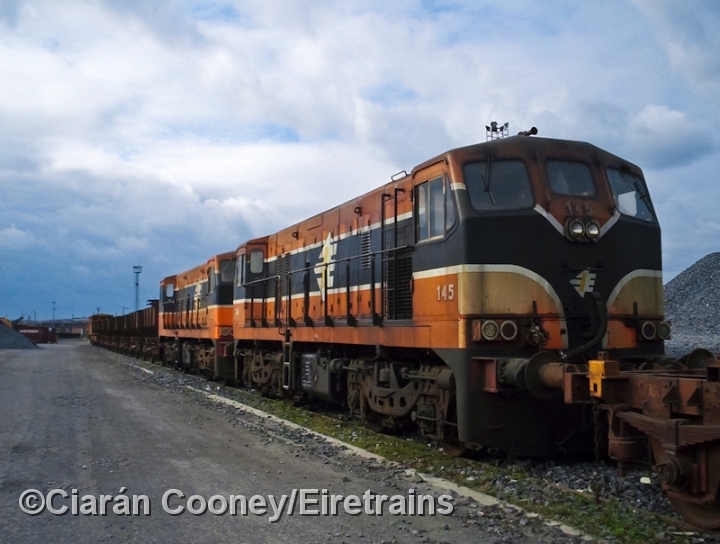 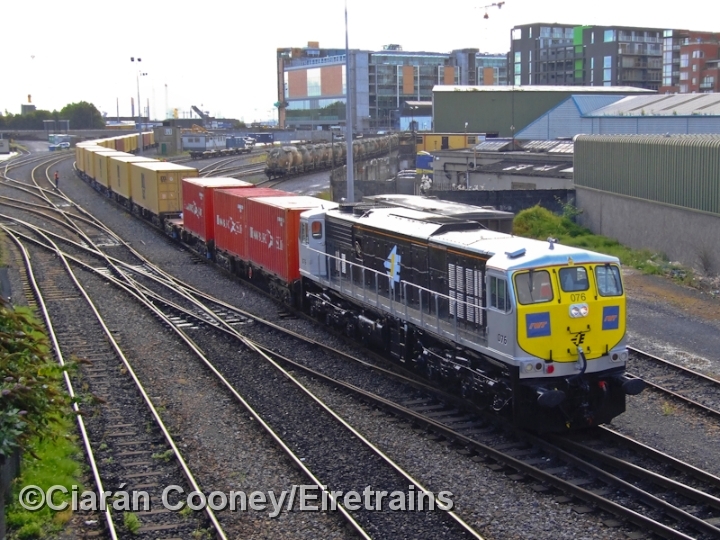 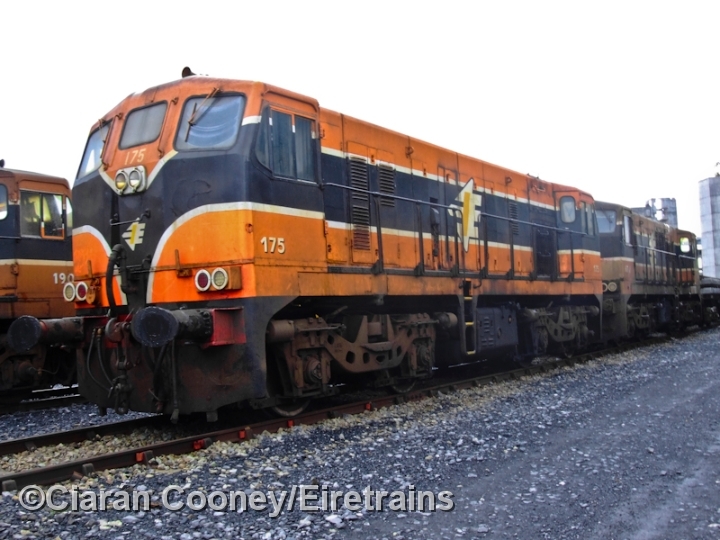 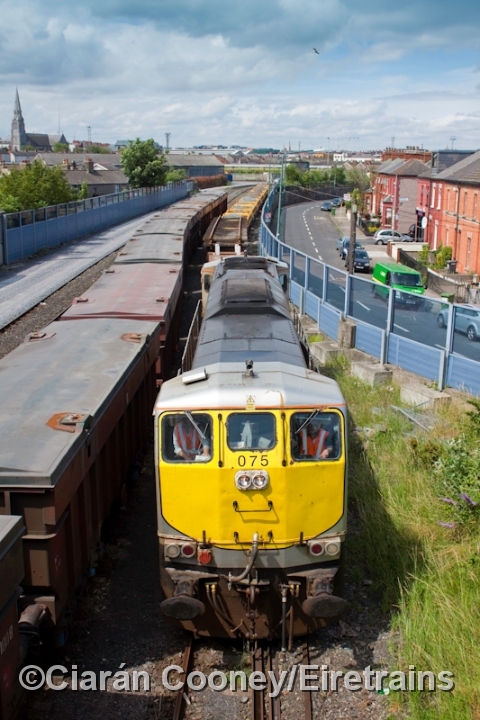 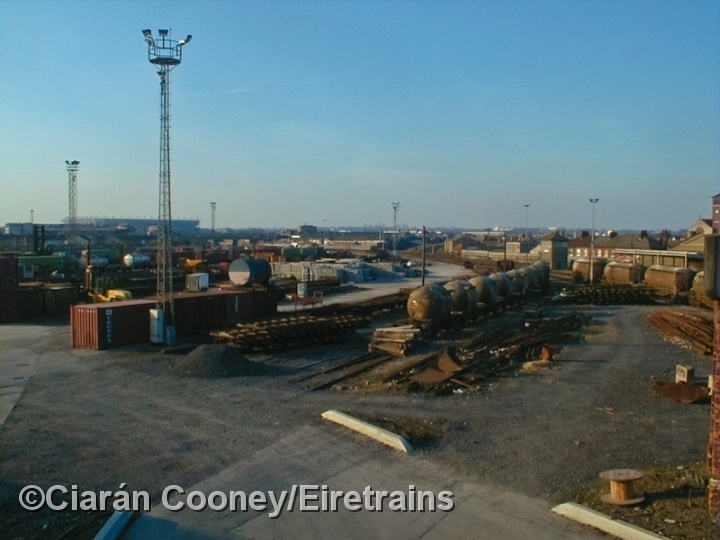 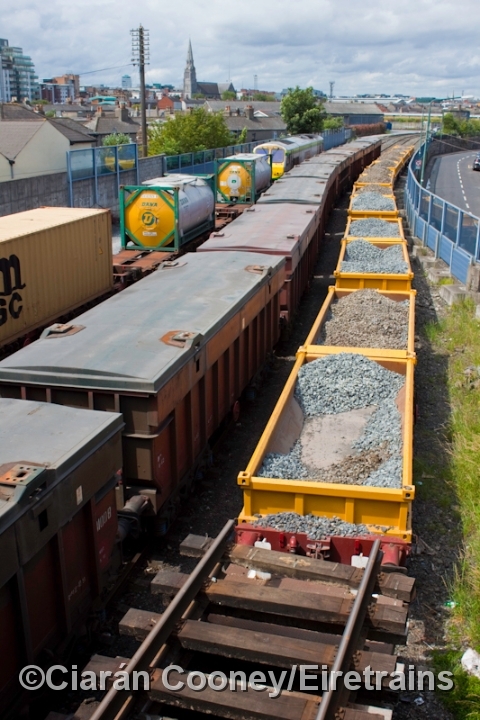 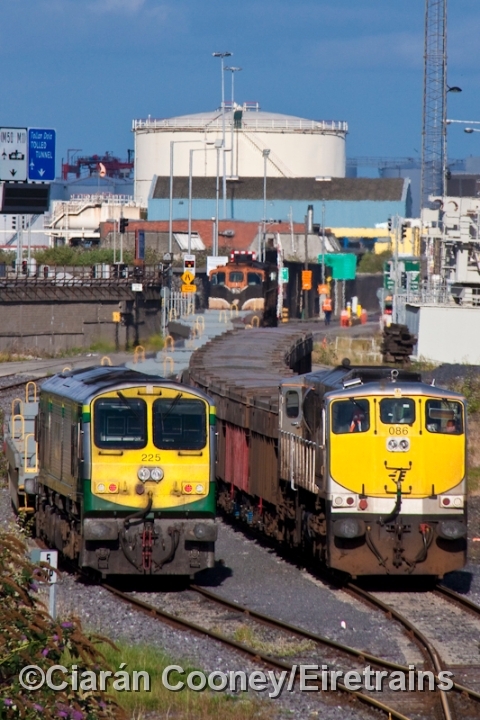 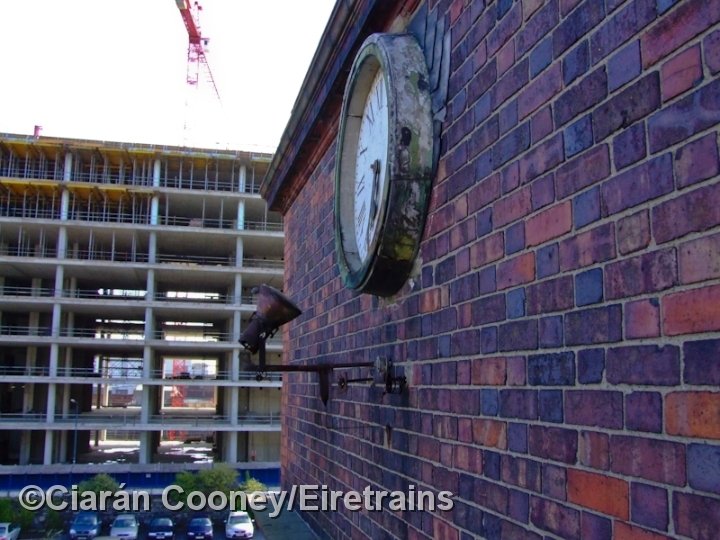 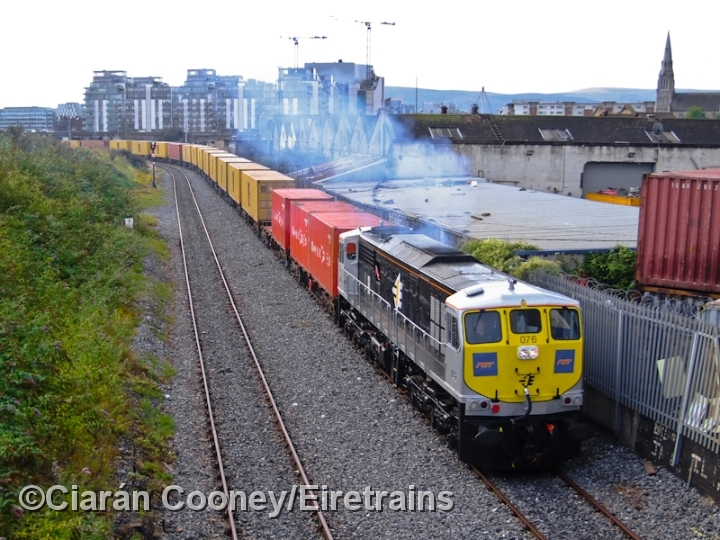 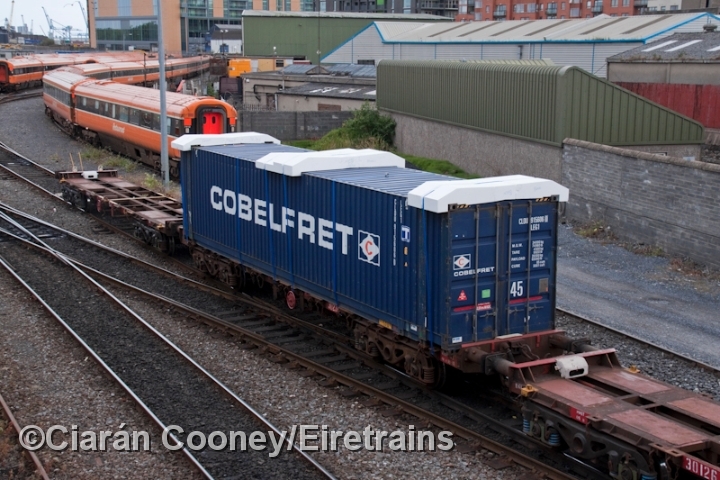 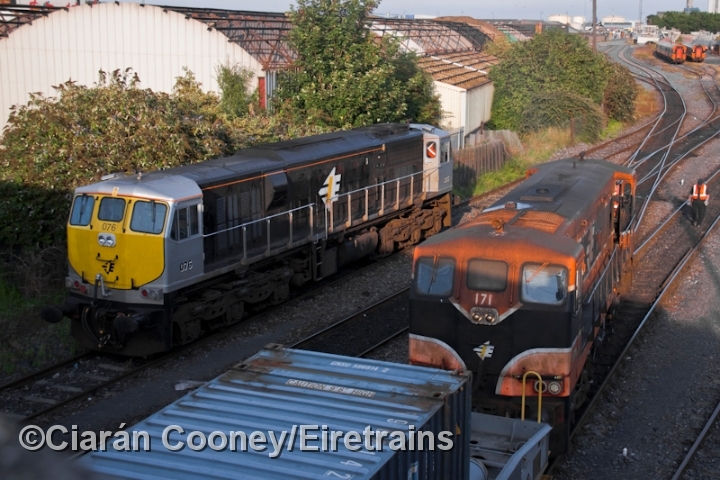 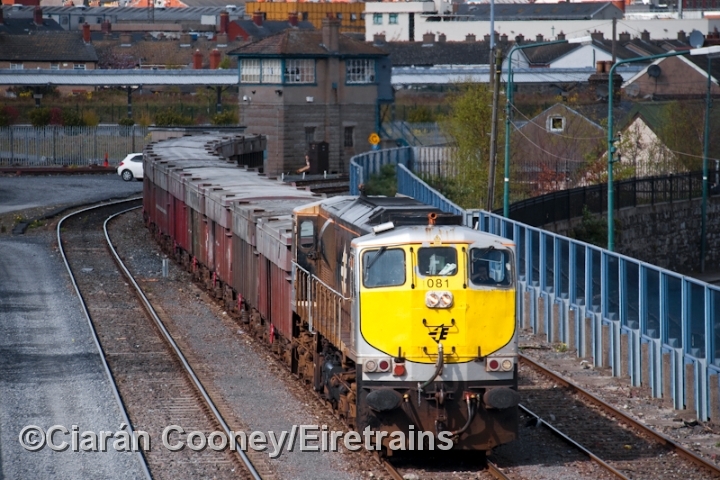 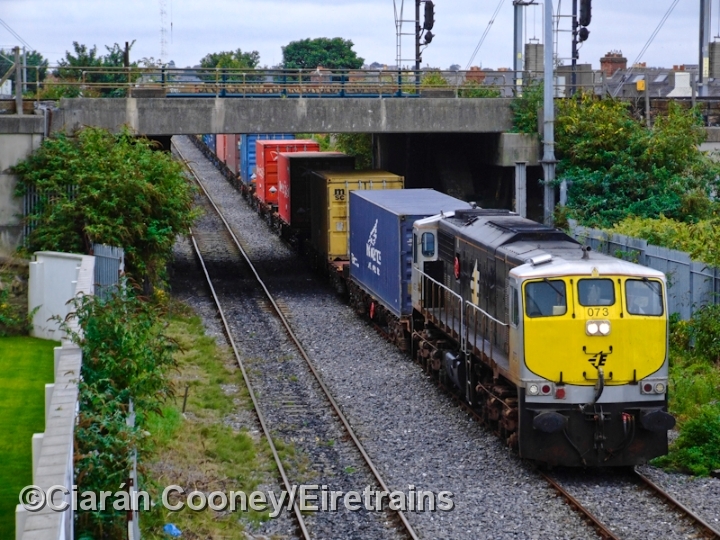 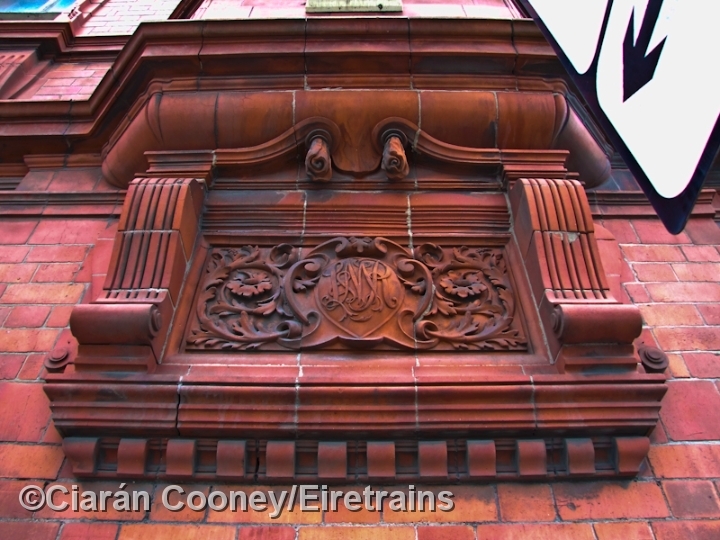 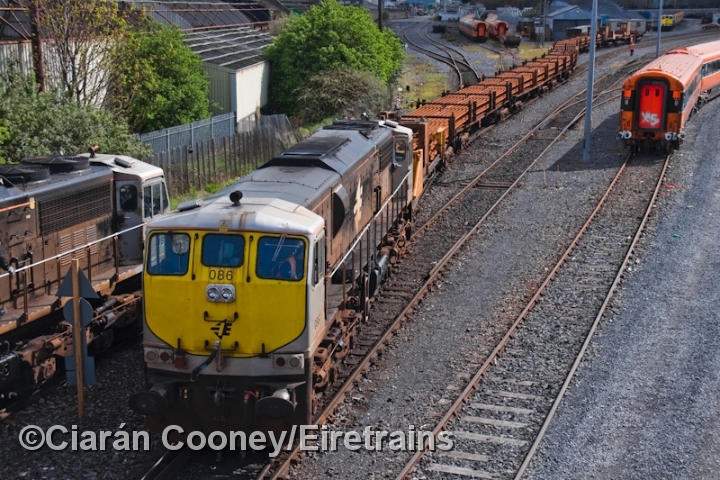 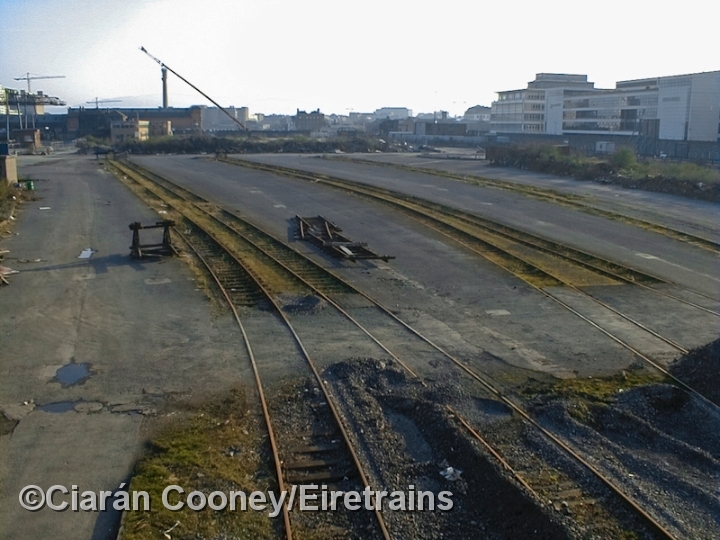 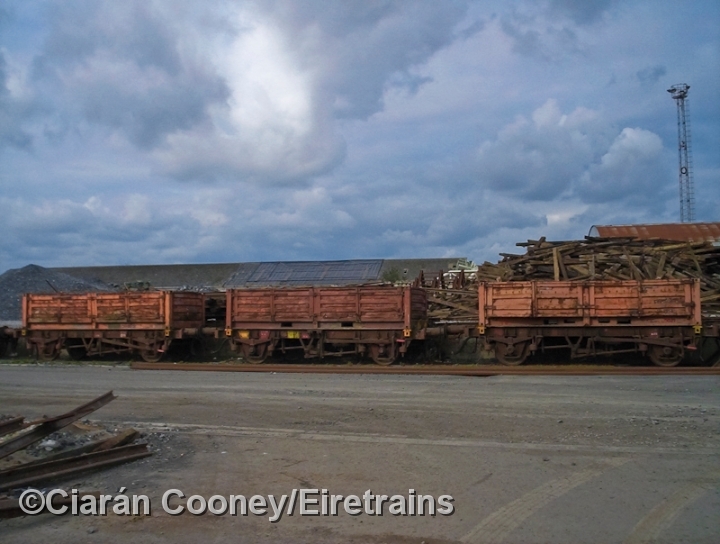 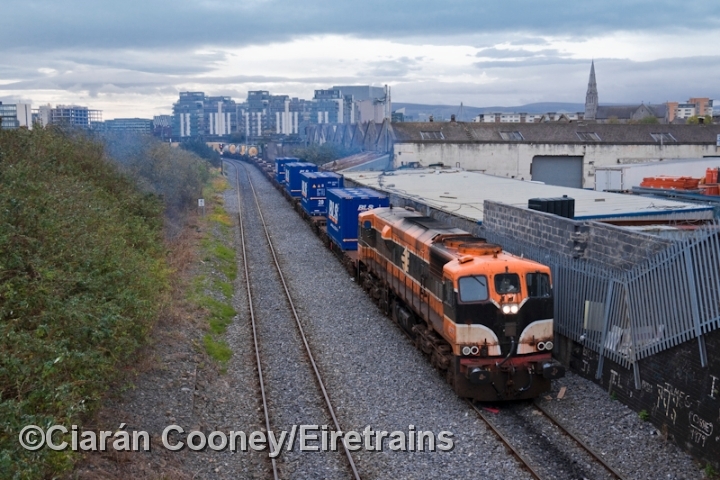 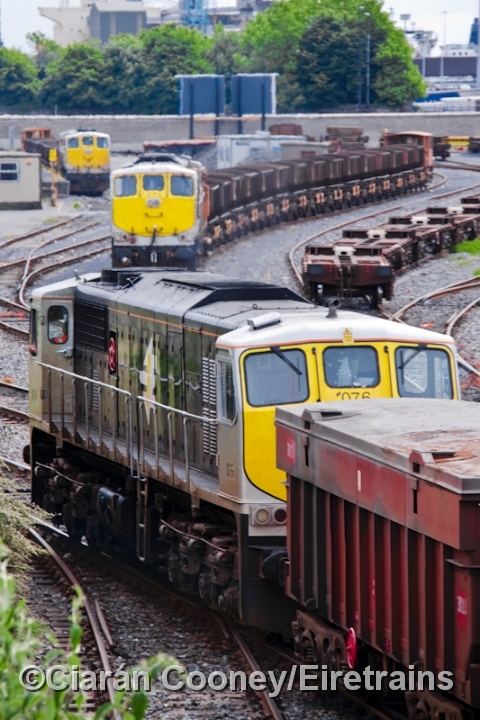 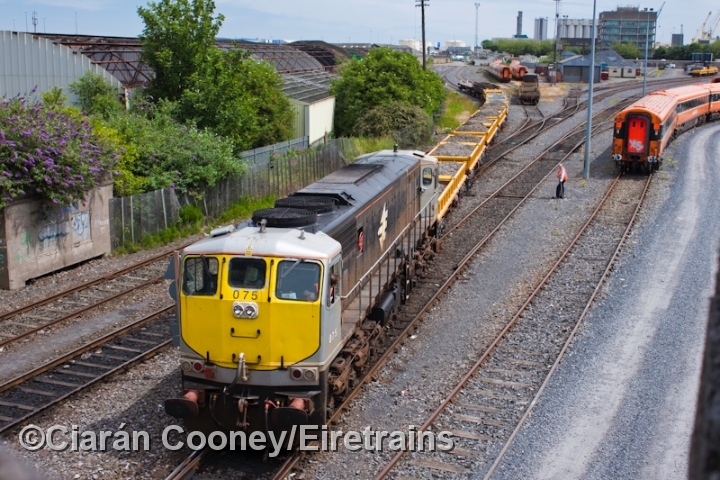 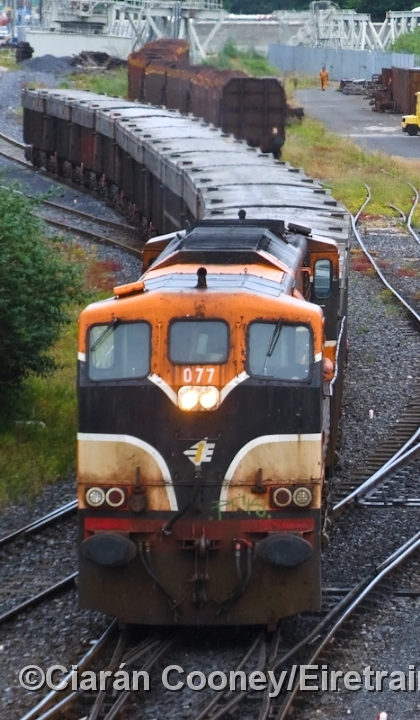 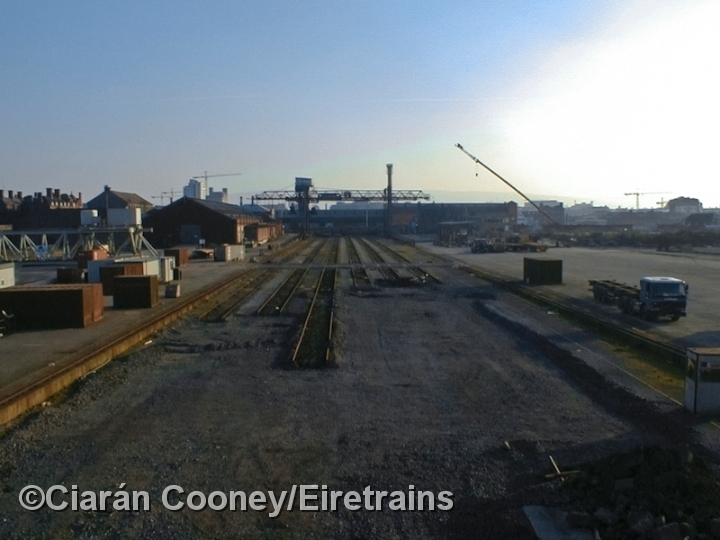 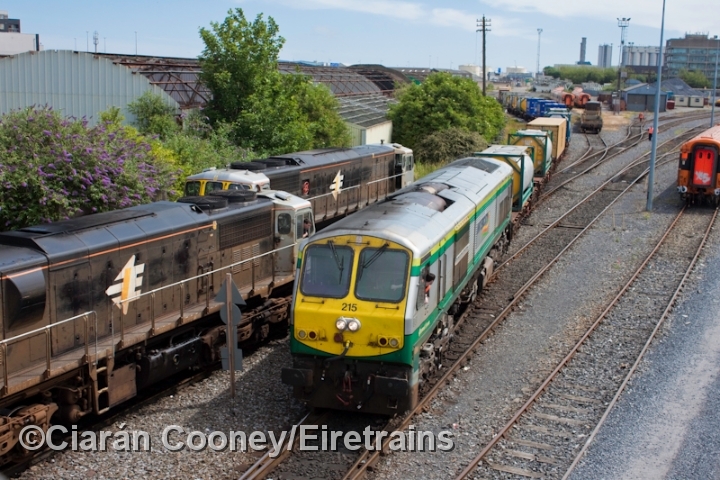 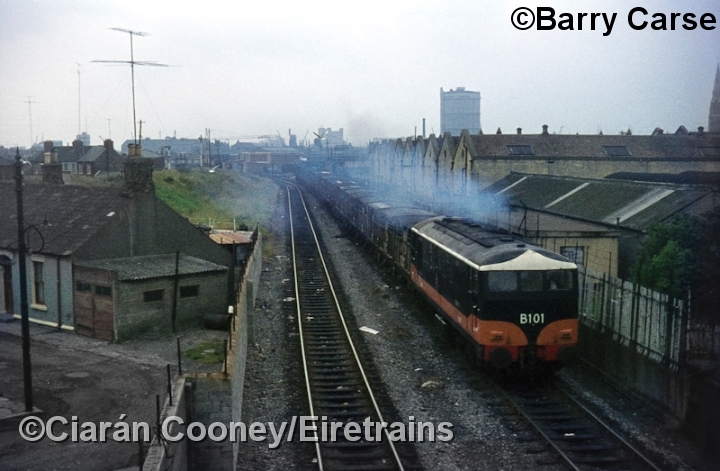 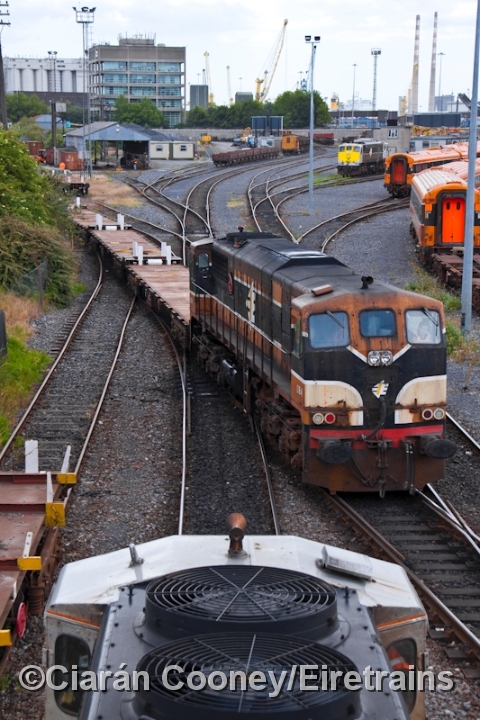 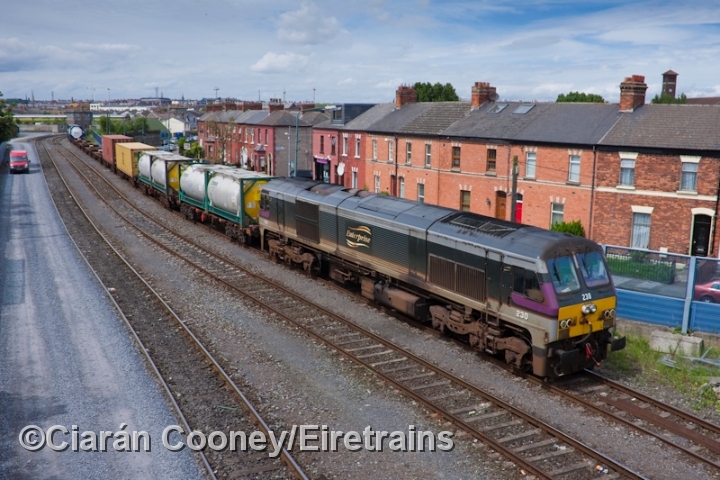 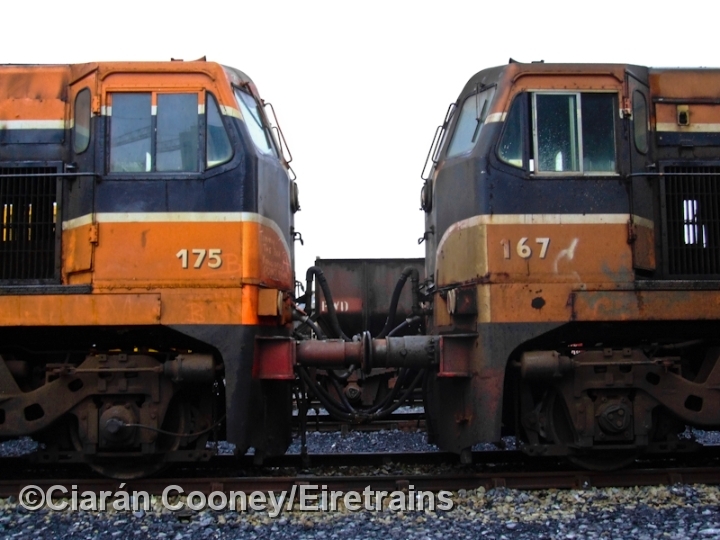 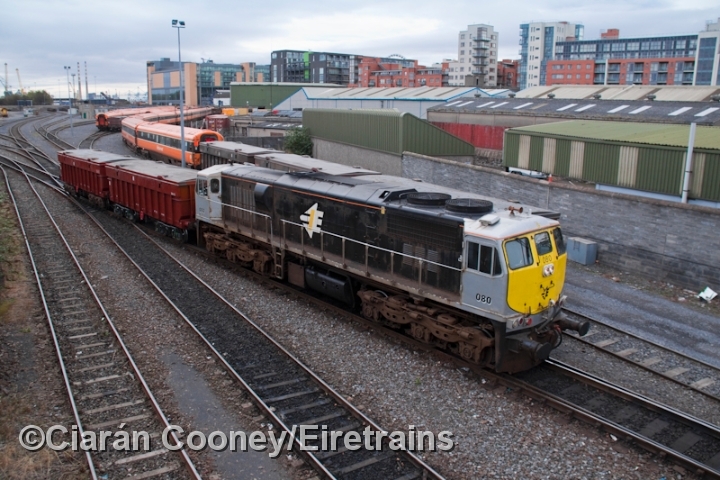 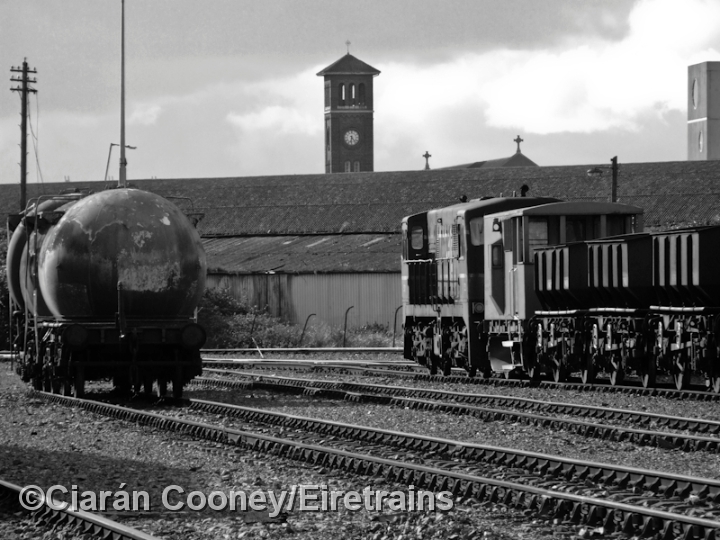 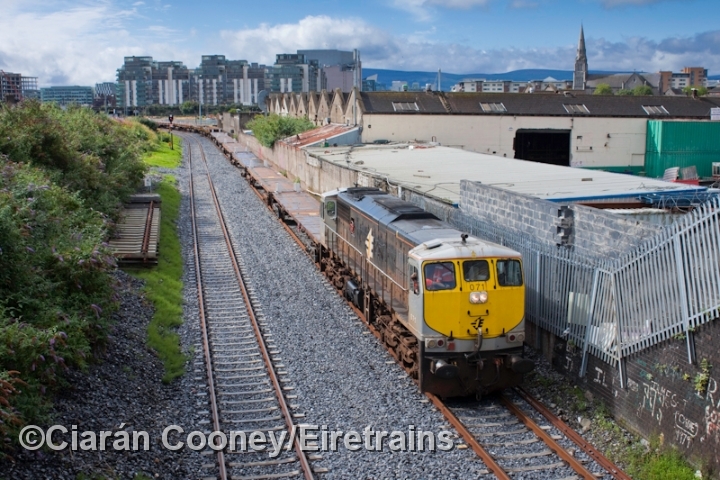 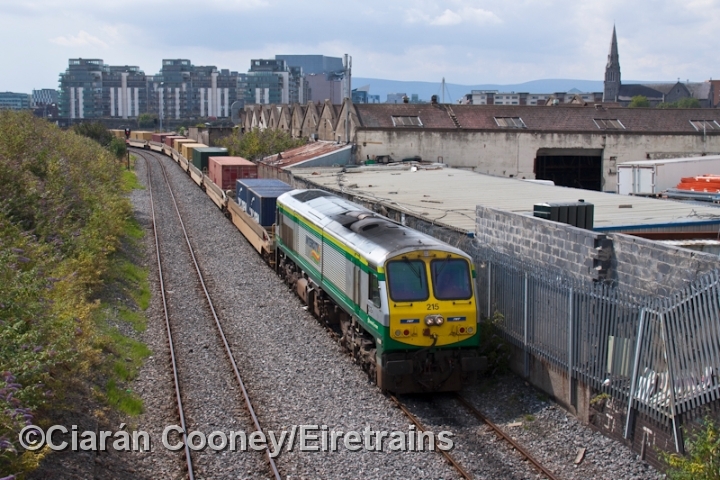 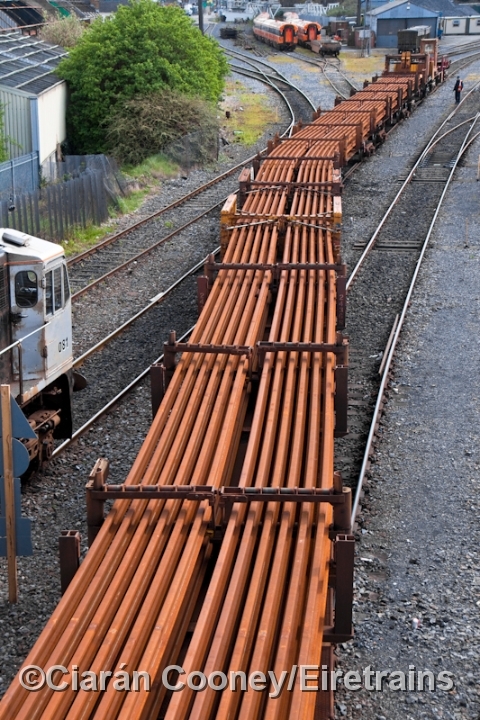 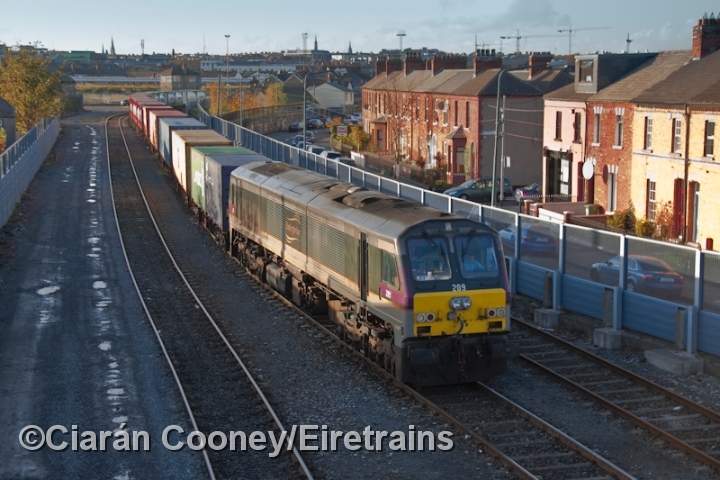 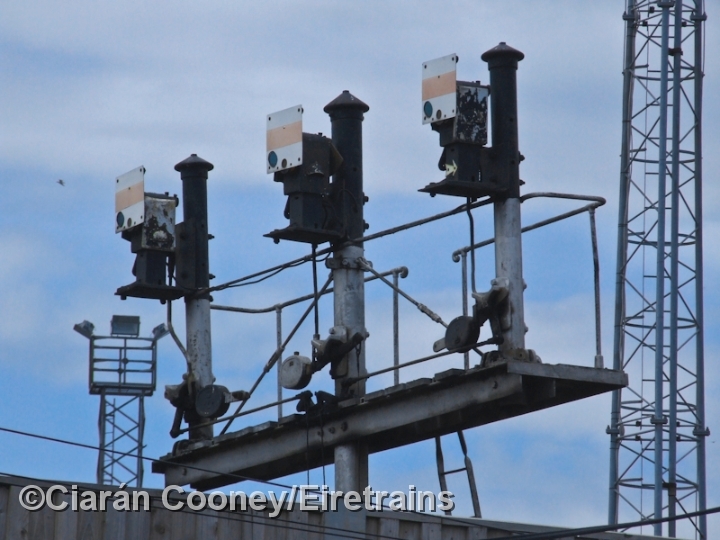 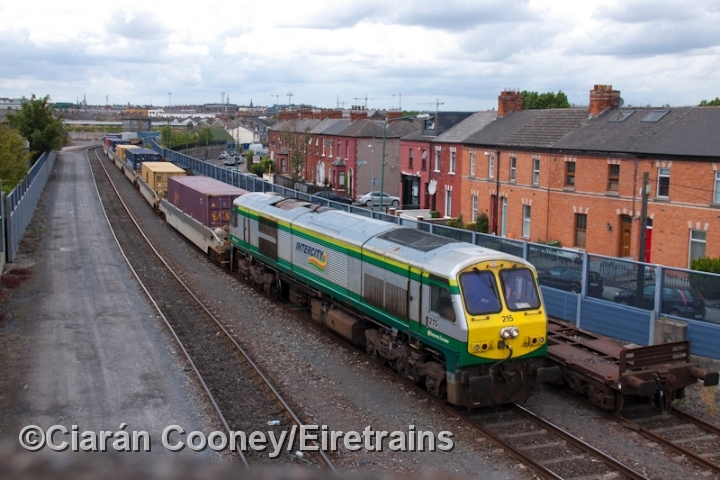 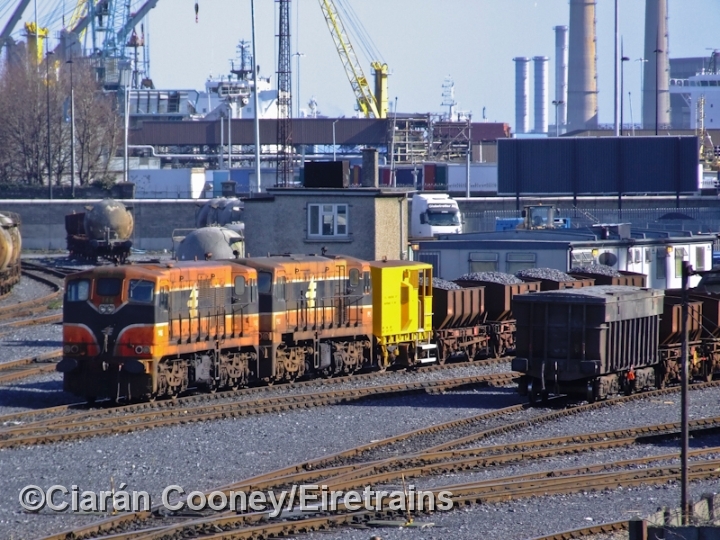 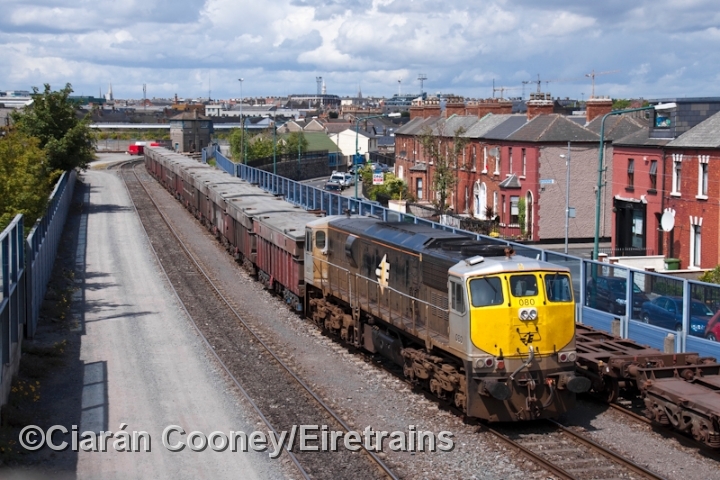 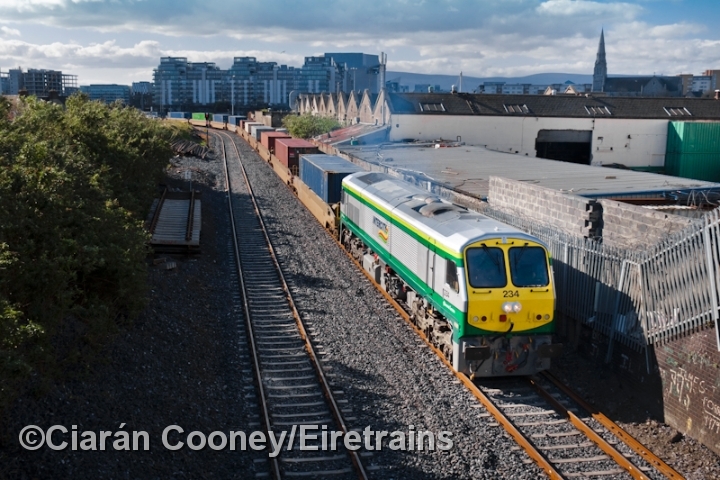 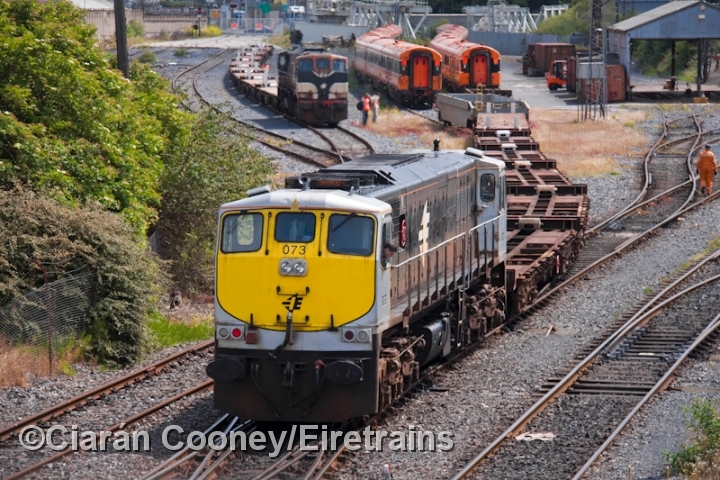 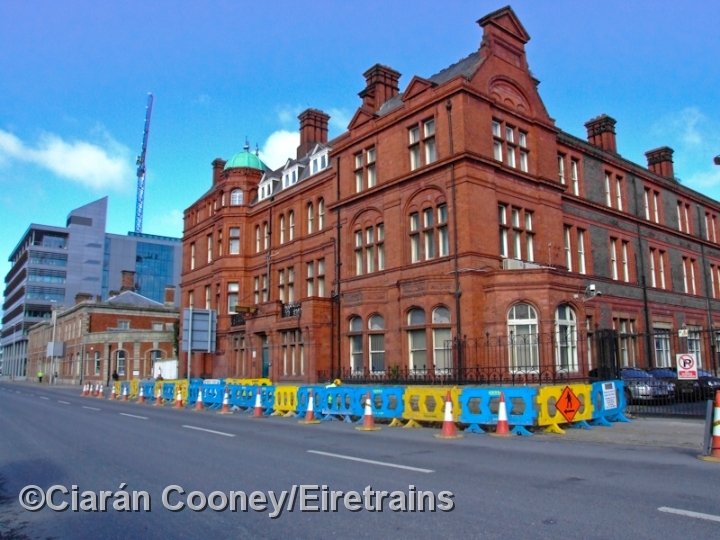 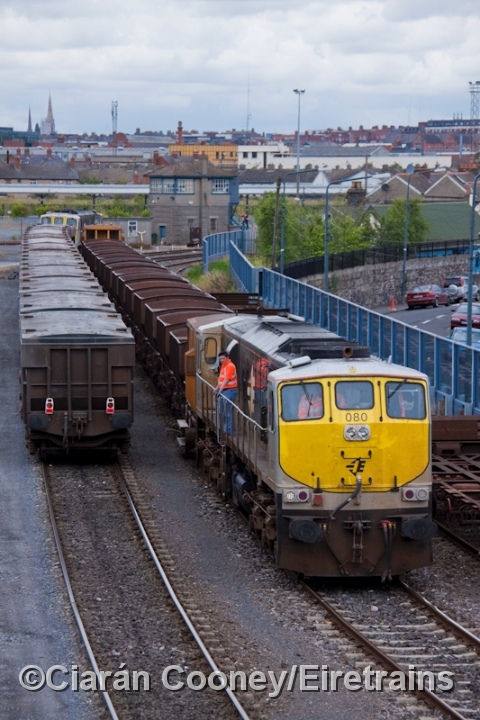 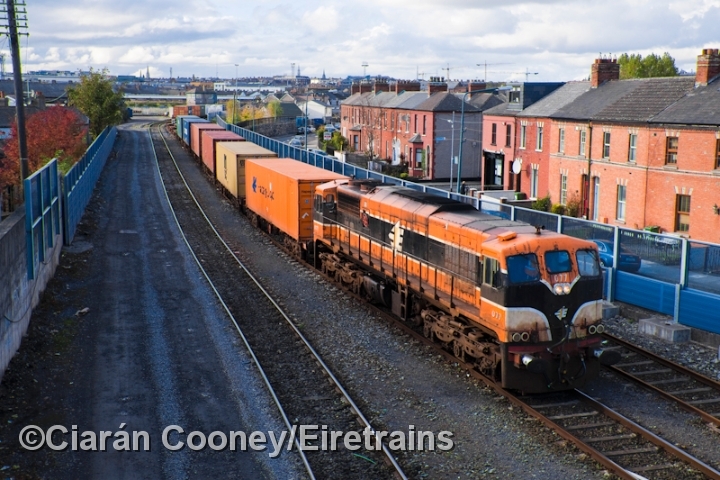 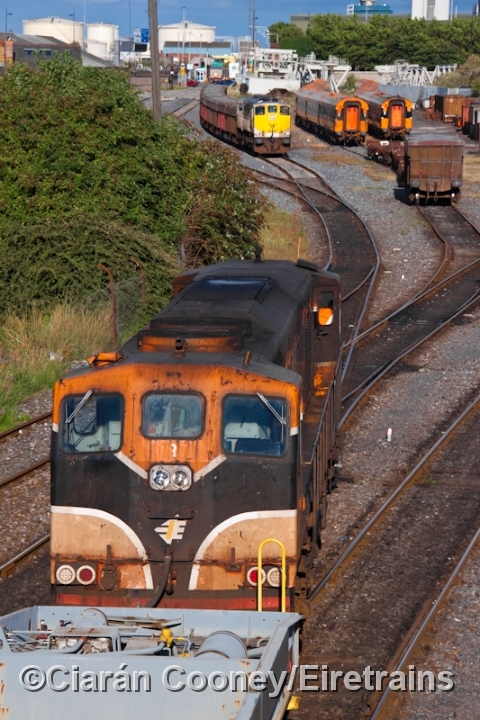 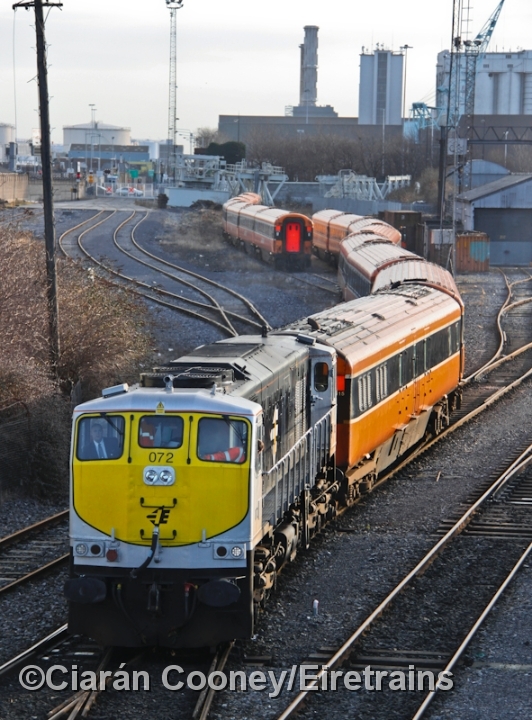 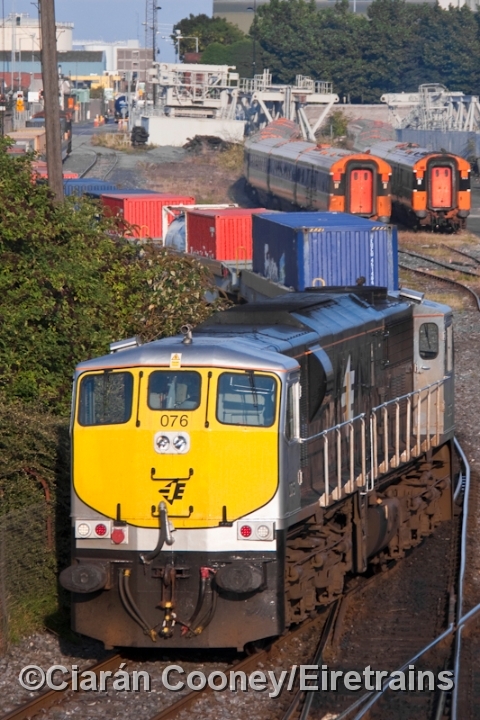 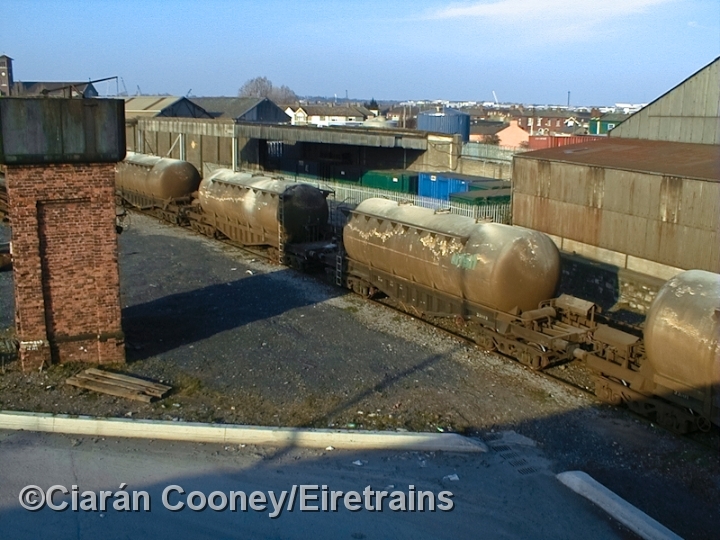 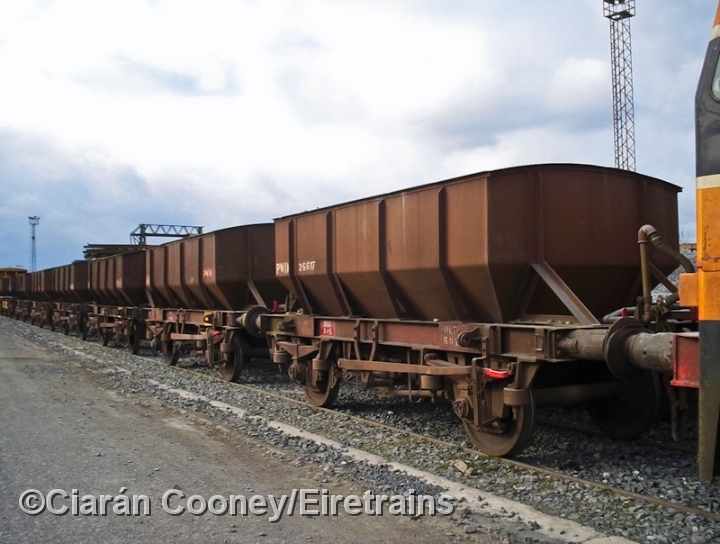 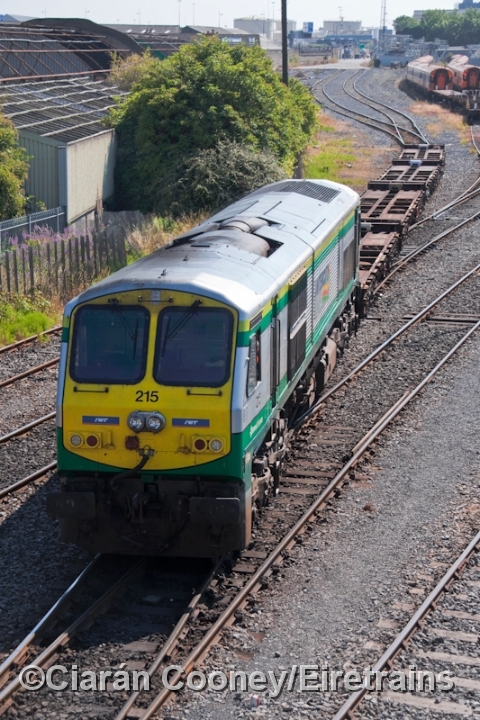 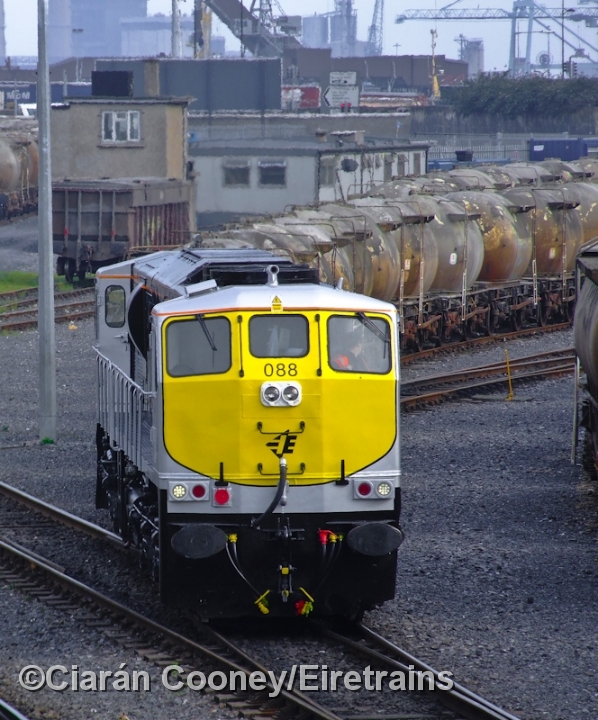 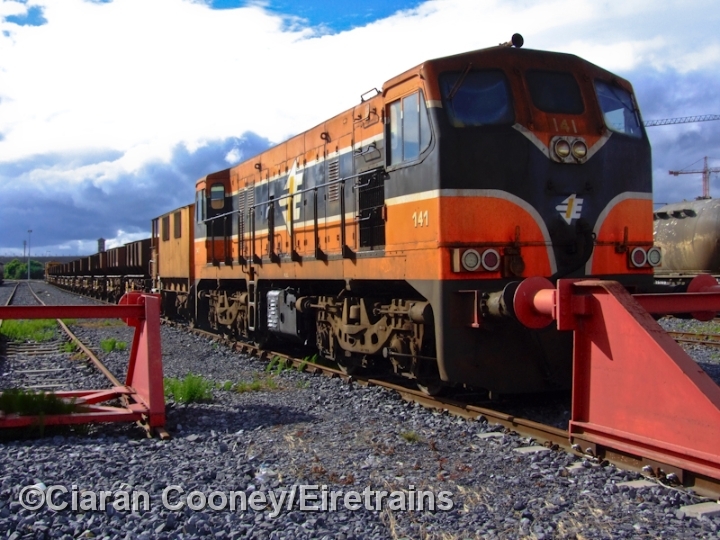 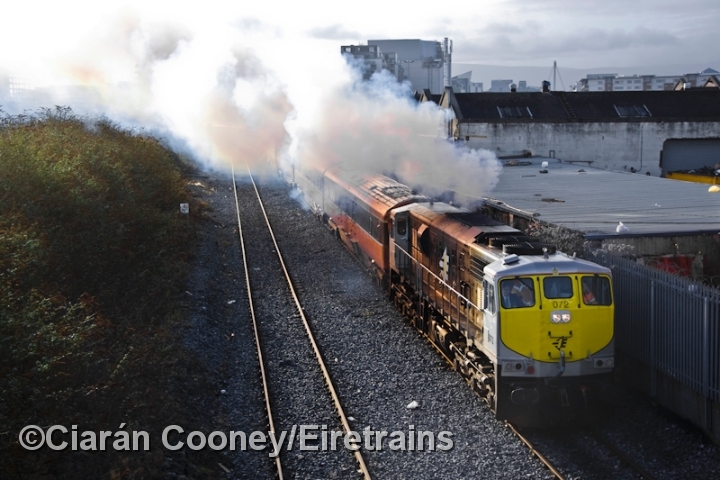 Since the 1870s, the first railway companies of Ireland had begun to establish their own large goods yards in east Dublin City, adjacent to Dublin Port. 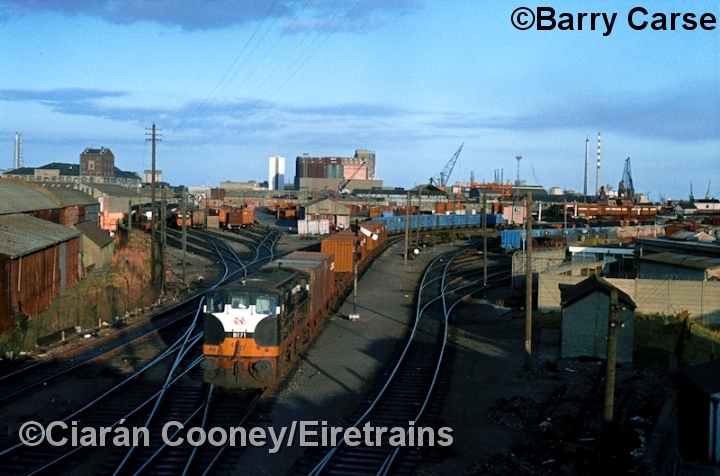 These yards had all remained largely intact up until the 1970s, when new container cranes and track simplification along with surplus yards closures came about with the introduction of bulk freight trains. 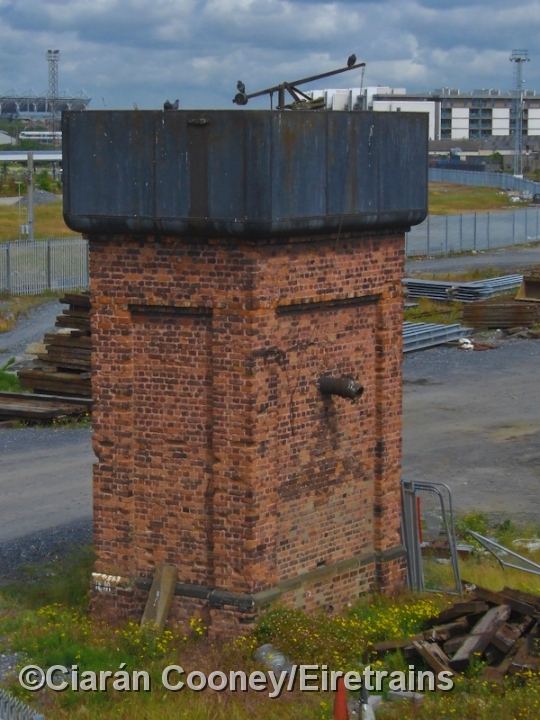 East Wall yard, established here by the Great Northern Railway in the 1870s, is nowadays a ballast loading point and civil engineers sidings. 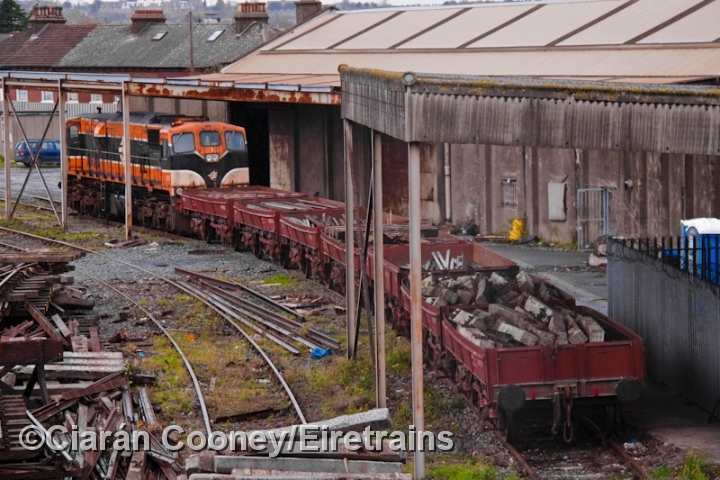 A wagon repair shed was also built here in the 1970s. 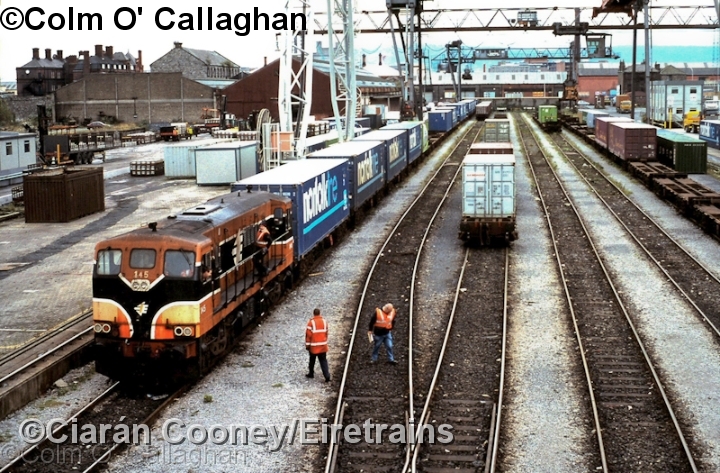 The yard was simplified in recent years, and the container loading gantry was removed. 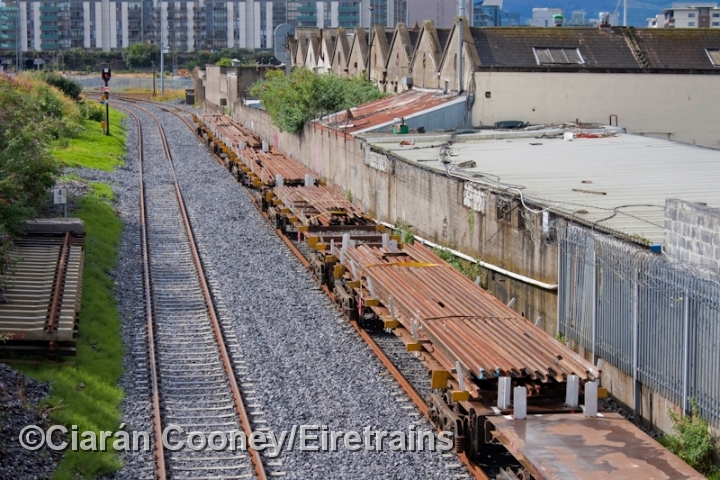 The line to the Alexandra Road tramway also passes through East Wall yard. 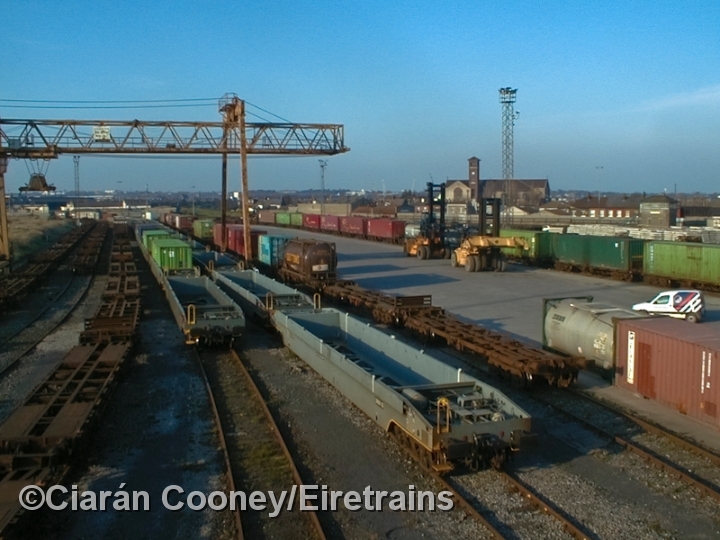 A link line also ran from East Wall to the Great Southern & Western Railway's goods yard at the Point Depot, which closed in the late 1980s. 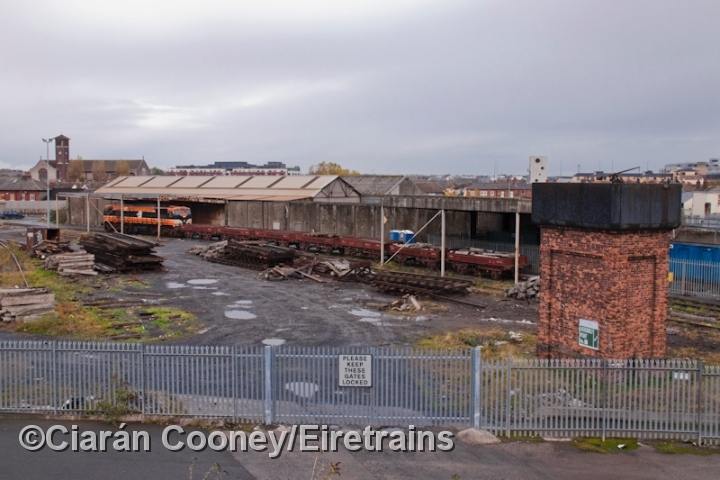 The London & North Western Railway yard at North Wall was established in the 1870s, it once also had a passenger service, withdrawn as early as 1922. 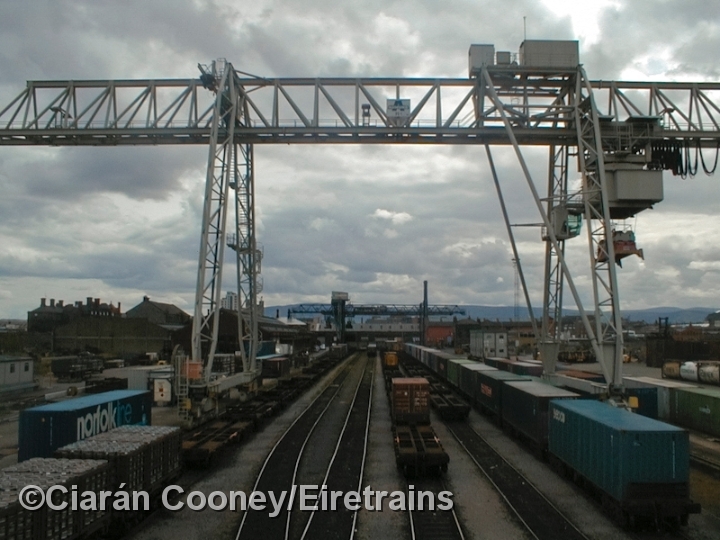 The yard was upgraded with new cranes, both in 1970 and 1994, but the withdrawal of container traffic resulted in the closure of the yard in 2005. 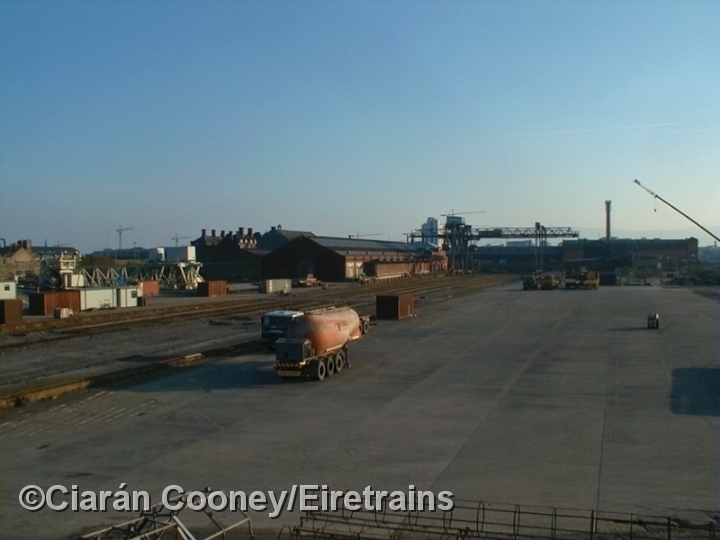 Adjacent to the LNWR yard was the Midland Great Western Railway's goods yard, later used for loading containers by forklift. 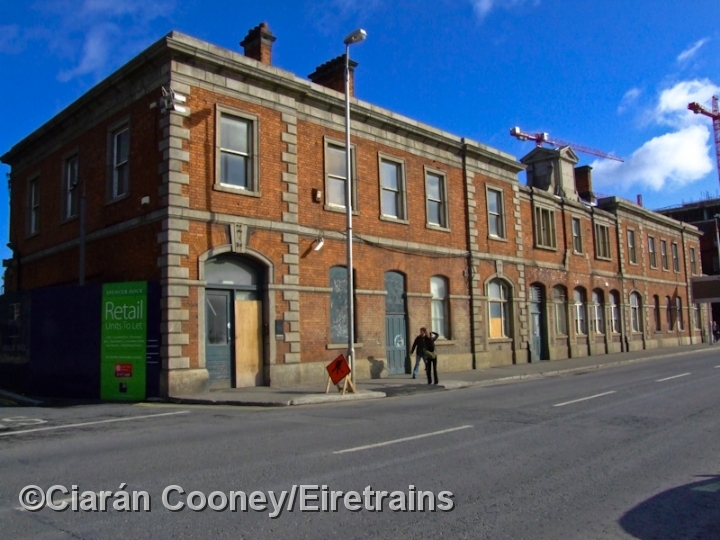 In use up to late 1990s, it too closed in 2005 and now the Docklands Station stands on its northern site.